View Limoncello Adventures on kmmk17's travel map. The final day of the holiday was the trip back to Naples, with time to explore the city before flying home later in the evening. 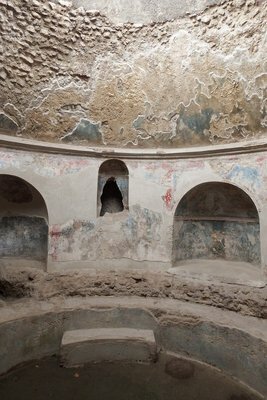 We began the day by leaving the hotel and heading to the station, just as we did yesterday on the way to Pompeii, however this time we carried on, past Herculaneum and onto Naples itself. 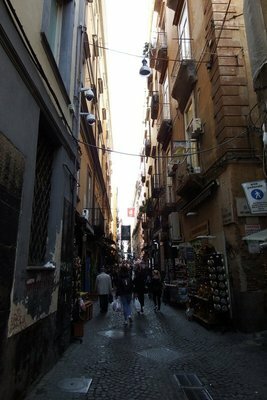 Unfortunately this part of Naples is not particularly pleasant, being in bad condition and nothing particularly special to look at. Before long we had made it to the other side of the area without even stopping. 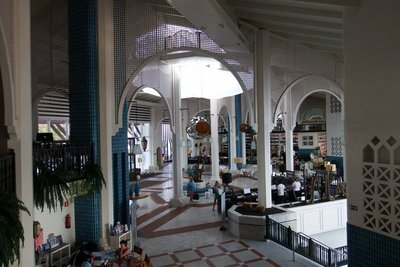 We had arrived at the main commercial shopping street, but again, we barely stopped. We had planned to stop for an ice cream - but even though it was 20C, there were few places if any that sold it - and when they did it was a fortune! - maybe it's out of season? The locals were wearing puffer jackets after all! After a lot of walking we had made it towards the port where a lot more of the sights are located. 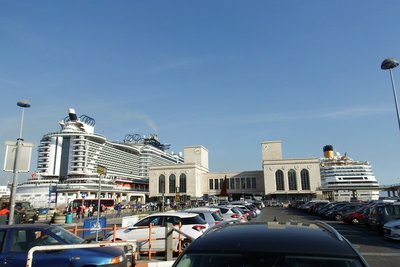 Walking past the town hall we had views of the Port and the huge cruise ships that had shown up. 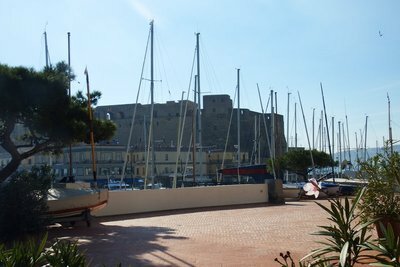 Next to the port is the castle, which imposes on the whole of the local area with it's circular towers. We took a walk along the side towards the waterfront, before heading south to the Ovo Castle, and where there were more views of Vesuvius across the bay. 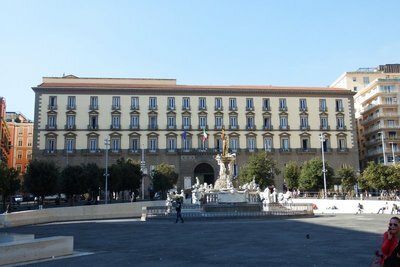 Heading back towards the city we stopped at the Piazza del Plebiscito, where the royal palace and basilica are located opposite each other on this square just around the corner from the castle. 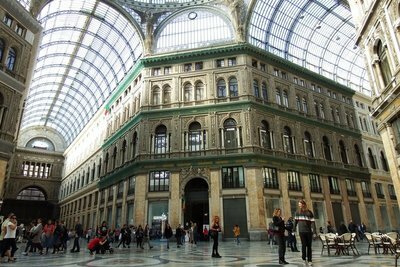 The final place for us to visit was the beautiful Galleria Umberto I, reminiscent of the famous shopping gallery in Milan, where we stopped for food and grabbed some postcards. We then headed past the castle to the port itself where we caught the bus and headed to the airport, despite it being several hours before our flight. However time passes quickly, and it didn't take long before it was time to start boarding. After getting passed the 'bag police' at check in who were strictly enforcing the baggage allowances, we boarded the plane and hoped we could fly directly to Luton instead of stopping in Milan again! Luckily we were on a direct flight this time, and after getting through the airport we were eventually back home after a busy weekend in the sun! 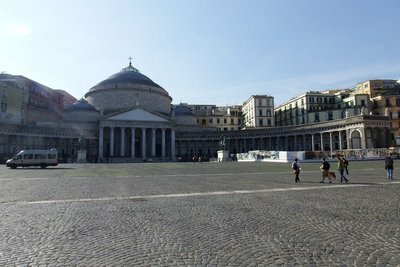 Although Naples was a bit of a dump, and not really worth visiting unless there already. However the rest of the trip around the Amalfi Coast was beautiful and it was a pleasantly surprising weekend away that is highly recommended! After a busy few first days, today would be more relaxing. Getting up later for breakfast we took our time heading for the station to take the train to today's sightseeing destination - Pompeii. The train started off not too busy, however after stopping at the first few stations the train quickly filed with people. 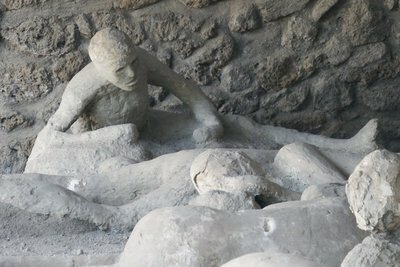 By the time we arrived in the town of Pompei, it was going to be a struggle to get off - although we weren't the only ones. 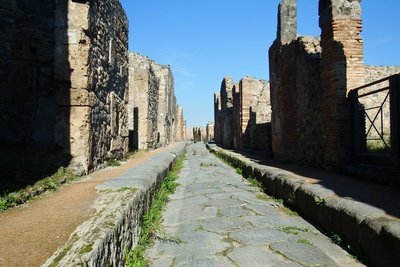 Eventually making it out of the station with half the train, we crossed the road to enter the archaeological site of Pompeii, upon which the town revolves. 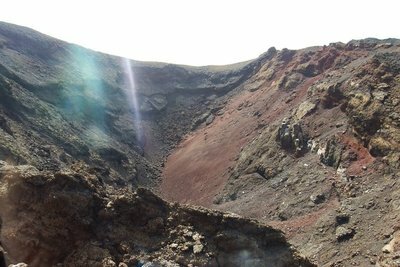 It wasn't cheap to enter Pompeii, but it was a must. 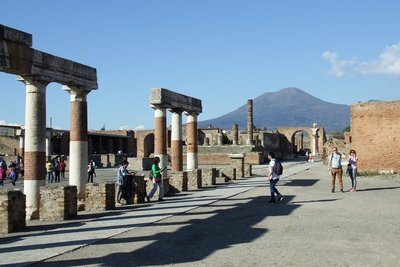 We began by heading up the main street towards the forum, where there were views of Vesuvius through the ruins it created in 79 AD. From here we headed north through the well preserved streets, where the crowds emptied out and we were able to enjoy streets to ourselves. 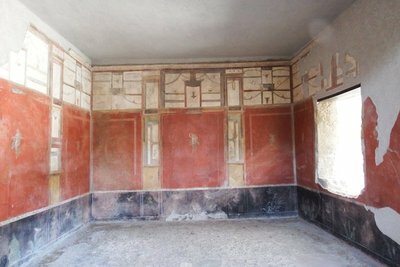 After exploring the north of the former town, we headed back towards the main street, looking inside some of the villas with preserved frescos before heading south towards the Garden of the Fugitives, where some bodies of those who tried to escape became fossilised. We then made our way towards the eastern side of the complex, taking a look inside the gymnasium before heading into the amphitheatre, where a photoshoot of a rather unattractive girl was being carried out by her mother who was dressed in red from head to toe - a hideous sight. After this hilarity we made our way back through the complex, taking a look in more villas before reaching the Bathhouse. Eventually leaving Pompeii, we took the half hour train ride back through the tunnels of the peninsula to Sorrento. We then chilled in our hotel room before heading out for dinner and a final walk around the town on our last night of the trip. 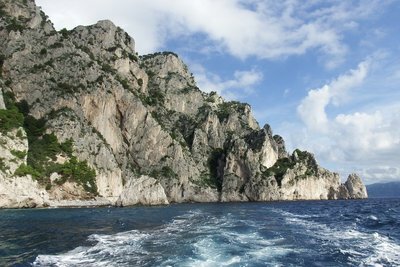 During the planning for this trip, the Amalfi coast was originally overlooked, however after seeing how beautiful it was, we decided we simply had to make room for it amongst the trip. 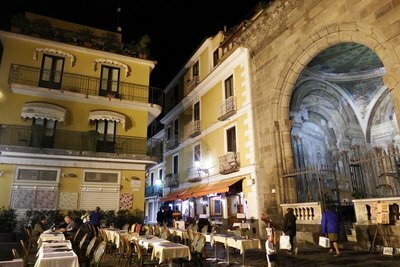 After our first evening in Sorrento, we arose early for breakfast, before heading down to catch the ferry over to Capri, which was now running on a winter schedule. Just 40 minutes later we had arrived on the small touristy island, and quickly bought our tickets for the island tour that was leaving shortly after, and then boarded the small boat. Like a duck we had spent little time on land so far! 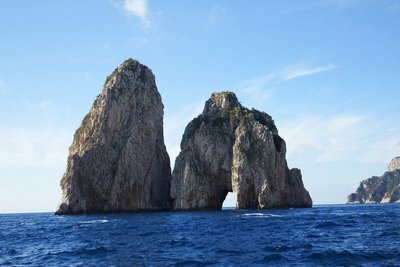 Moving around and settling on back row seats, we then headed out of the harbour clockwise, past the cliffs and grottos before we made it to the Faraglioni - sea stacks just off the coast, through which we sailed. 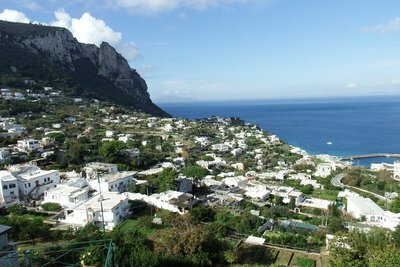 We then headed around the south of the island, taking in the November sun, and with views of the south side of Capri town and the hills of Anacapri. 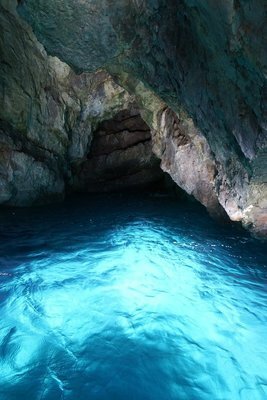 We then headed in to the Grotto Verde, which had beautiful blue water, before heading around the lighthouse towards the northern side with views of the Bay of Naples and Vesuvius. 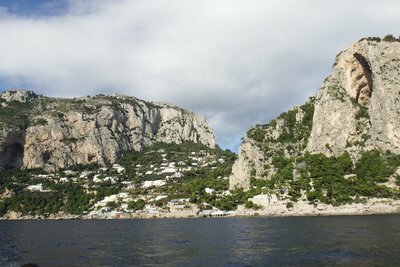 After heading past the Blue Grotto, which was closed due to the high tide and rough seas, we then landed back in Capri harbour and explored the town. Walking up the hill, being thankful we didn't visit in July, we eventually arrived in the town square, which was full of people. 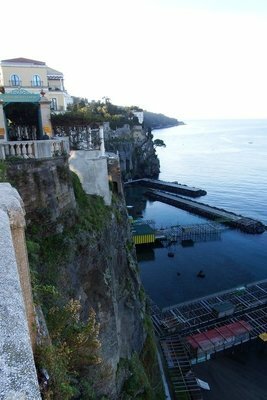 After walking around and viewing the beautiful views of the island from the vantage point around the corner, we then walked back down the hill before catching the ferry back to Sorrento. As we had headed out early, we had enough time to spend the afternoon on the Amalfi coast. 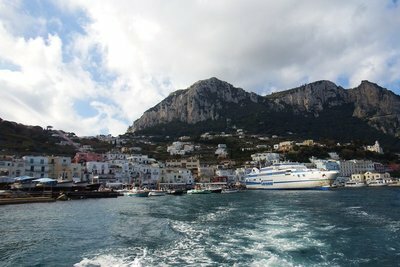 We therefore headed quickly through the town to the station to catch the bus to Positano, which we boarded not long later. 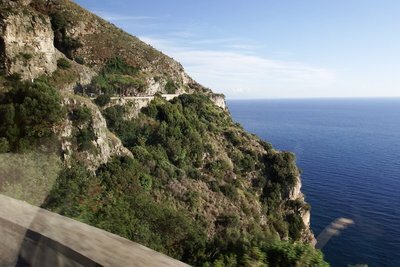 The bus headed up through the winding hills with beautiful views over the Bay of Naples, before long we were over the top of the hills and heading back down the hillside with views over the Amalfi Coast. The roads were once again windy, and along the coastline they were particularly spectacular, also being perched up on the cliff side. After a beautiful drive we soon arrived on the edge of Positano, where we left the bus with views over the beautiful town's gorge, which we then started to head down. 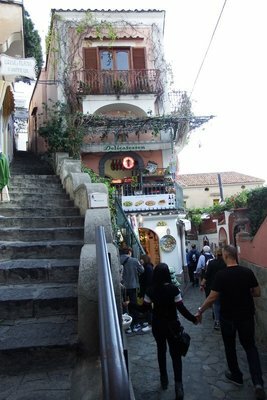 Numerous staircases later we entered the heart of the town, where even in November it was full of tourists. Being on the south coast it had glorious sunshine, where there were no mountains to hide the winter sun. 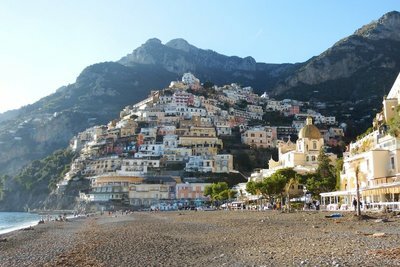 We took a walk down to the beach, where the scale of the mountains becomes evident, before walking back through the town and on to the bus stop for our return to Sorrento. The buses were pretty busy, and as we arrived at the point where the winter schedule skips a bus, by the time it showed up it was full! Luckily we got a space, but it meant standing room only all the way back to Sorrento. 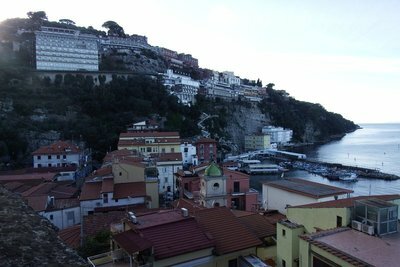 After almost an hour, the lack of room and constant turns started to give us both travel sickness, but in the nick of time we arrived back in Sorrento and into the fresh air. With today being a busy day we decided to grab pizza from a pizzeria so that we could then chill for the rest of the day. However as it wasn't yet 6pm, there was almost nowhere open! After walking all around the town, we eventually found a take away close to our hotel, but they wouldn't be ready to serve for another half hour. Therefore we headed back to our hotel for a rest and to drop our bits off, before collecting the pizza later. Eventually grabbing dinner, we then spent the rest of the evening chilling before more excitement tomorrow. 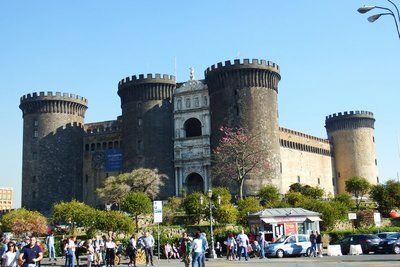 After last year's autumn holiday was postponed, this year we decided to make sure we weren't bored in the Autumn by reviving the plans to visit the Naples area. 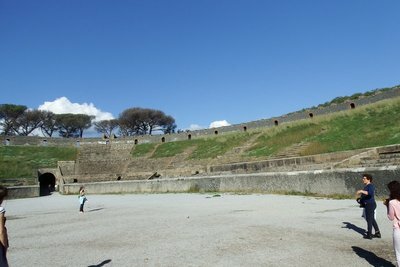 I had wanted to visit Pompeii for some time, and after some research had seen it was easy to get to Naples, and spend a weekend in the area which was also very beautiful. One of the passengers sat near us had a seizure and collapsed, lying unconscious on the floor. After the flight attendants called for any medically trained passengers on the flight to come over it was decided she was not well enough to make it all the way to Naples as we were still over Germany. Therefore an emergency landing was planned and we were now headed for Milan! She then woke back up and spent the rest of the flight throwing up before we landed safely. Upon landing she started making a call to her friends to pick her up once she was through immigration, still out of it, and being the only person the flight who didn't know we were actually in Milan. The medics quickly boarded to help her off, but she was having none of it. 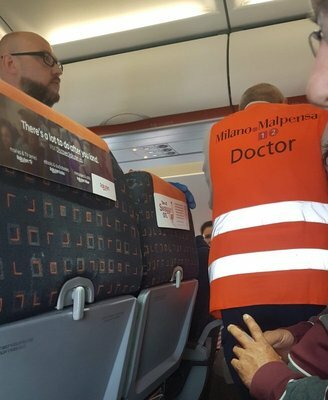 She complained that they should have just taken her to Naples, and the medics agreed - whilst the flight attendants pointed out that she was not in that condition in the air. After standing their ground and threatening to get the police to remove her if she didn't go with the medics, she eventually left and after refuelling we were able to take off, only an hour and a half behind schedule. 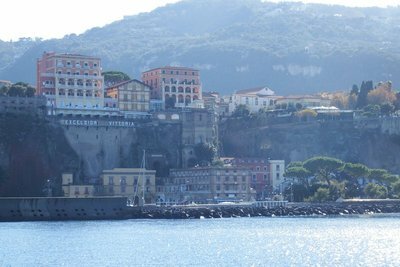 Eventually arriving in Naples at lunchtime, we quickly made our way through the airport to catch the next shuttle transfer bus directly to Sorrento. The small minibus was almost full already, but there was enough space for us, and we were soon leaving the crazy traffic of Naples behind for the crazy roads of the Sorrentine Peninsula. After a somewhat stressful and cramped hour's journey, we were finally in our base for the weekend. After checking in and dropping off our bits at the hotel we then headed off on a short walk around the small tourist town. 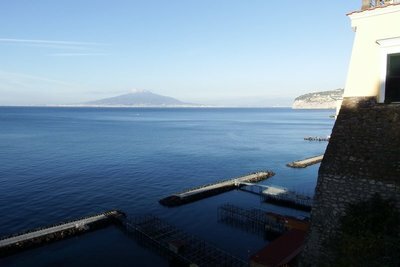 We began by heading towards the cliffs that impose over the coastline, overlooking the Bay of Naples, with views of Mount Vesuvius. After walking along the coastline we then headed into the heart of the town, grabbed food in a local restaurant before walking amongst the local streets by night. The last thing to do tonight was to stop via the supermarket for some snacks and drinks before chilling for the evening of a long day. 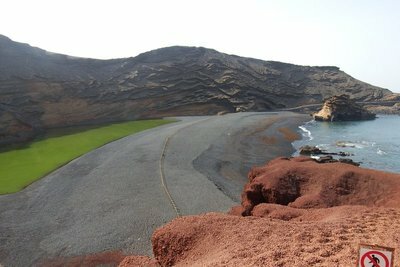 View Canary Islands on kmmk17's travel map. 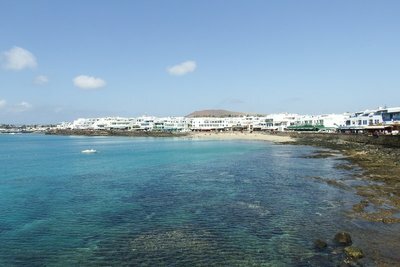 After around half an hour of crossing the short channel between the islands we arrived in Lanzarote. The ferry port is on the south side of the island in Playa Blanca, which was luckily where we were staying, and it was only a short walk with our suitcases to the hotel. 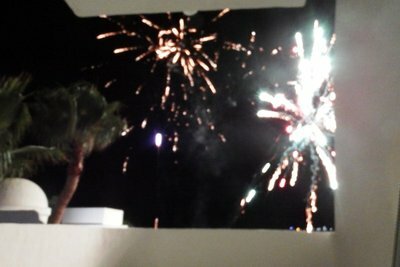 Similar to the last, being built into the hillside, we arrived at the reception on one of the top floors of the hotel. 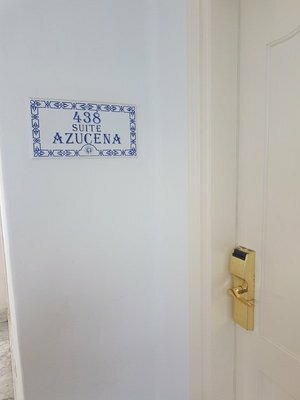 Check in was pretty quick and we walked down the corridor towards our room we noticed ours had an extra sign. As we got closer we couldn't believe our luck as it said "suite". 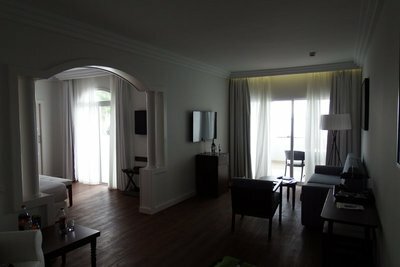 Inside we found that we hadn't just been given an upgrade, but had received the best they had, a suite with a huge bed, sofa, two tvs, double balcony with sun loungers, and a complimentary bottle of wine. 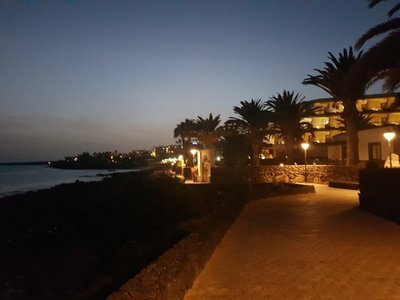 After settling in, and taking a tour around the complex, we made our way down to our first dinner in the new hotel, and found it far better than that in Fuerteventura. 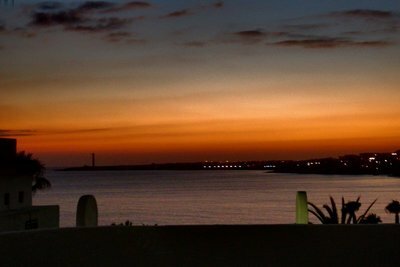 The rest of the evening to this long day of travelling was spent chilling and enjoying the sunset from the room - at least until the fireworks show later on, which were exploding just metres from our window! The following day was another relax day. After breakfast we took a walk down the coast to the harbour, before sitting around the pools and taking a dip. 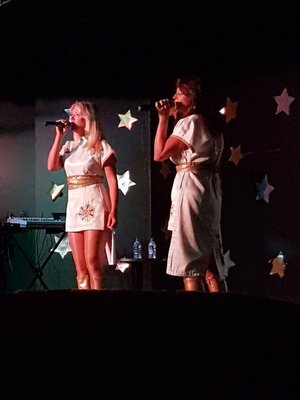 The evening had an ABBA tribute act, and so we decided to sit watch the performance. The following morning we had booked an excursion to the National Park. We woke up earlier than usual to be ready for the pick up at the hotel. Waiting before the pick up time many coaches showed up, but not the one for us. We waited and waited, as did a few other people who appeared to be on the same tour as us, but nothing. By now it was half an hour late so I made a call to the number of the confirmation form. I was told it would be on it's way, but when i queried that it was already now half an hour late I was told that it had already been here and we weren't there. Absolute rubbish, as we were there 15 minutes prior, but nevertheless no trip for us. I was told there was space on the excursion the following day but I would need to rebook. I contacted the booking agency and explained and luckily they rebooked us without further charge. However by now I was not only annoyed at being lied to, but also having to get up early to sit around and wait for nothing. Tomorrow would now be another early start and who knows if we would even make it on a bus? Nevertheless we still had the day to relax, so we did the same as yesterday sitting around the pool before dinner and an evening walk. The following morning after another early start we were not very hopeful. We showed up even earlier, and tried to be more pushy with each coach that did turn up to make sure we didn't miss the right one. But eventually the correct bus showed up - right on time and right outside the hotel, exactly where it was supposed to. This definitely didn't happen yesterday! As we boarded the bus the lady asked if I was Kevin - yes I said as she apologised for yesterday saying it was her fault! Well, at least we were on the right bus. The other couple who were on the same tour as us however we not so fortunate, as after a bit of confusion were not allowed on. Who knows what was going on, but we were on a bus at least and headed to the national park. After picking up many others, we finally made it to the tour proper. We began by stopping at the the Lago Verde, a green lagoon in the middle of a half submerged volcanic crater, filled with minerals and microorganisms. We had a nice view from the edge overlooking the lake, black sandy beach and the sea. Continuing through the remnants of dried black lava from the last volcanic eruption, the next place on the trip was just down the coast at Los Hervideros. 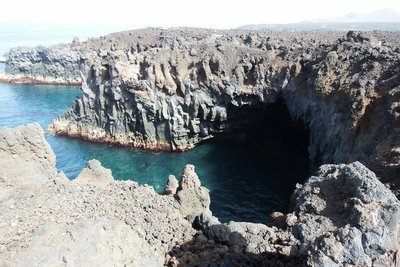 This coastal area has cliffs made from the solidification of the lava and subsequent erosion, causing unusual balconies overlooking the sea smashing into the cliffside. After driving past the salt farms we headed further inland to the wine growing areas. 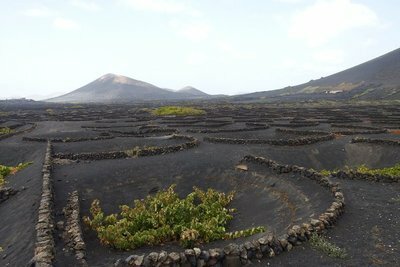 Here grapes are grown in holes in the ground, which keep them warm and shielded from the wind. We had a taste of the local wine, which was almost syrup like, before boarding the bus again. 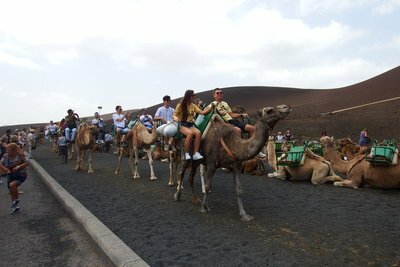 We were now headed for the edge of the national park proper, where there are camel rides. Although we weren't interested in taking a ride, we did watch others, including the couple who were refused onto our bus this morning - they must have been on a different tour to us after all! After a lunch break we finally made it to the national park. 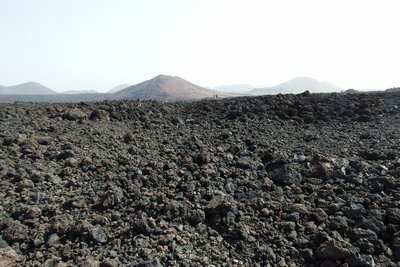 Here it looked like Mars, with orange sand, and craters unlike anywhere else I'd ever seen. We stopped at the entrance to the park where a restaurant sits on the top of a steep hill next to geological experiment areas. 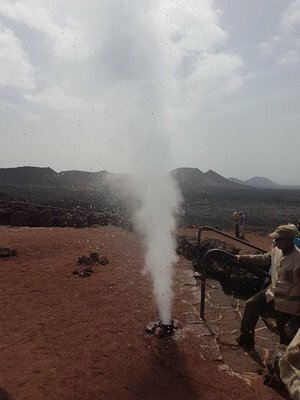 We were first shown the heat beneath us, with burning gravel just inches beneath our feet, before shown hay burning from just sitting inside a hole, and the most exciting - a geyser experiment with water being poured into a vent. 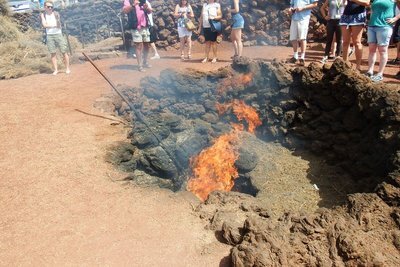 We then took a look inside the complex to see that the food served in the restaurant is cooked over a large natural chimney, before boarding the bus again for the last time. 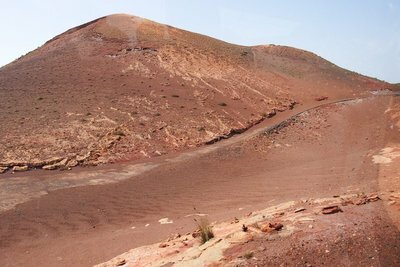 We were now headed for a half hour tour around the national park which would take us up, down and through the landscape showing the rocks and craters that make this place so unique. By now it was already getting late and after arriving back at the hotel we took a short rest before making our way down for dinner. Our final day was spent enjoying the sun, pools and beach, as well as taking a walk down the coast and popping into the local shops. With our time for collection the following day confirmed, tonight would be our final meal at the restaurant, and after tucking in to the last buffet, we enjoyed what remained of our final evening on the island. The following morning we checked out and boarded our transfer bus to the airport. After 4 hours of screaming children and views over Central London, we eventually made it home, but again like the journey on the way there, found by the time we got home we were pretty tired and it had taken all day! Nevertheless it was a great trip, enjoying something different from before, as well as a chance to finally rest after 9 months of working hard on our house.